On the oceanfront in the beautiful Cherry Grove section of North Myrtle Beach, South Carolina is a charming North Myrtle Beach resort. 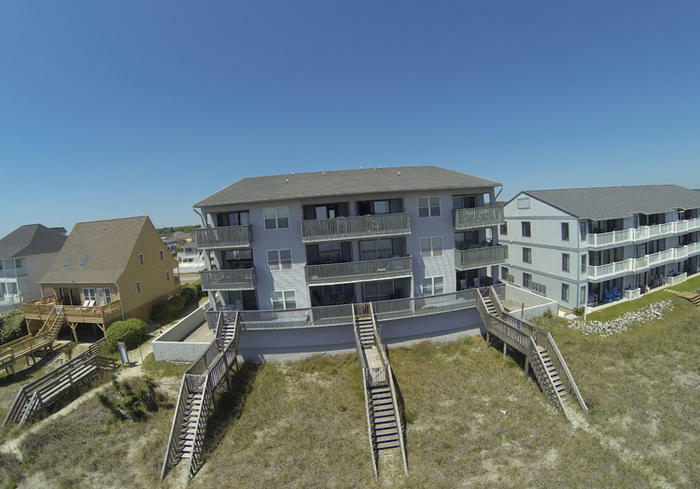 Sand Trap Villas is a three-story North Myrtle Beach resort on the oceanfront where each North Myrtle Beach condominium has beautiful oceanfront views. You don’t have to worry about the big crowds at this North Myrtle Beach resort because there are only nine North Myrtle Beach condominiums in all at Sand Trap Villas. Sand Trap Villas features a swimming pool with crystal blue water. Stretch out in a lounge chair on the pool deck and enjoy the sunshine while you read the latest bestseller, eat a snack or listen to your favorite music. Adjacent to the swimming pool area at Sand Trap Villas is a grill area where you and your family are invited to have a cookout at the beach. Sand Trap Villas is an oceanfront North Myrtle Beach resort that is built on stilts. This way all of the condos in North Myrtle Beach at this resort have better views and it also allows for covered parking on the ground level. Stairs lead from the bottom floor to all three levels of North Myrtle Beach condominiums at Sand Trap Villas. Race out to the beachfront when you spend your North Myrtle Beach vacation at Sand Trap Villas. The white sandy beaches are only steps away from your oceanfront balcony. There is just a dune line between Sand Trap Villas and the crashing waves of the Atlantic Ocean. Follow the path to the beach and you will be on the sand in seconds. Kick those flip flops off to the side and walk barefooted in the sand. Build royal sand castles and collect beautiful seashells in a sand bucket during your splendid North Myrtle Beach vacation at Sand Trap Villas. This oceanfront North Myrtle Beach resort has large North Myrtle Beach rentals. There are three-bedroom North Myrtle Beach vacation rentals at Sand Trap Villas with two baths and there are also more spacious North Myrtle Beach condo rentals at this North Myrtle Beach resort. The four-bedroom, three-bath condos in North Myrtle Beach, South Carolina can sleep up to 10 people. So pick the size that works best for your North Myrtle Beach vacation needs. A family of eight can comfortably reside in the three-bedroom North Myrtle Beach condos while the four-bedroom retreat is ideal for a golf foursome. Inside these oceanfront North Myrtle Beach vacation rentals are all of the condo features that will help your family and friends have a wonderful North Myrtle Beach vacation. There is a kitchen, dining area and living room in each of these condos in North Myrtle Beach, South Carolina. With these amenities and furnishings your surroundings in these North Myrtle Beach rentals will feel just like home. Each of these kitchens in these North Myrtle Beach condo rentals are nicely furnished with full-size appliances, cookware, dishes and utensils. There is even a dishwasher in all of these North Myrtle Beach condominiums. Use the dining table for meals and games during your North Myrtle Beach vacation. Relax in the living room as you plan your North Myrtle Beach vacation day and again at the end of your North Myrtle Beach vacation day. Elliott Beach Rentals is not affiliated with onsite management or the HOA of Sand Trap Villas. Signup to receive special Vacation Rental, Real Estate & Golf offers from Elliott Realty! © 1959 – 2019 Elliott Realty. All Rights Reserved.